This week marks a new era for the PPS website. The go-to source for placemaking for more than 20 years, the website has been the place to find everything from placemaking principles and case studies to “What Makes a Successful Place?” to Placemaking Heroes. 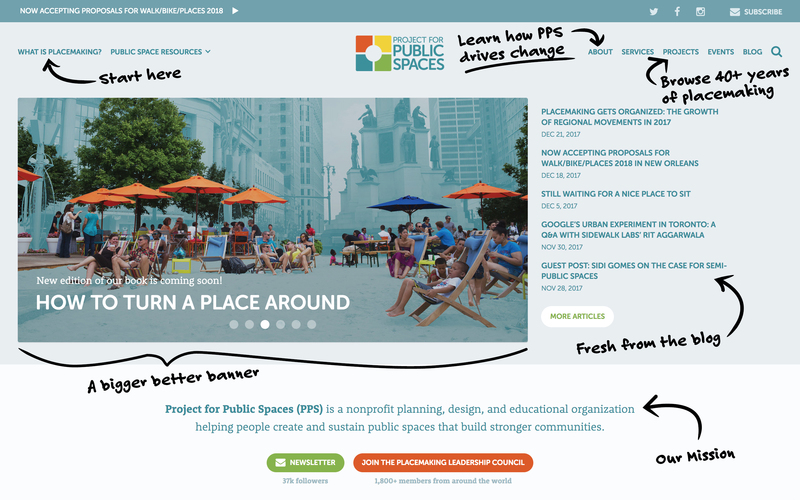 Now, just in time to kick off a new year of placemaking, our online presence is getting an update. Some shiny new features on the new PPS website. The new website is both our hub for thought leadership and a digital space convening the latest and greatest in placemaking. We’ve taken another look at our top-performing resources, from Placemaking 101 to our top blogs, project experiences, and trainings, placing them front-and-center on our new site. We’ve also expanded our Great Public Spaces page, and we’re showing off our new strategy for the years ahead! We hope to continue to tell the story of the placemaking movement, with the help of readers and placemakers everywhere. Placemaking has evolved in recent years, and with it, our digital coverage. We’re expanding our resources to delve into the transformative agendas that guide our work. 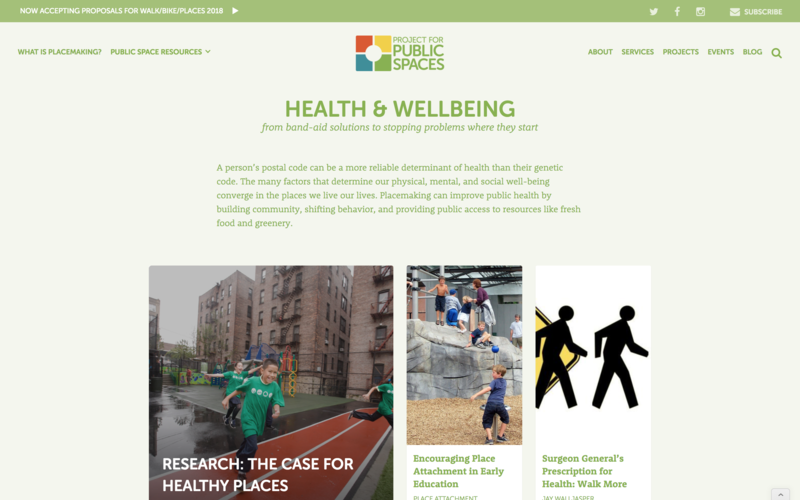 With sections devoted to Health and Well-Being, Sustainability and Resilience, Economic Development, and Equity, the new PPS website is set to tackle placemaking from many angles. We hope that this website continues to break down silos in the placemaking community: It has something for everyone, from environmentalists to community organizers to public health professionals. It will also serve as the online gathering place for the placemaking movement and its growing Placemaking Leadership Council. New sections on health and wellbeing, equity and inclusion, sustainability and resilience, and economic development on the new site demonstrate the evolving nature of placemaking. This is just the beginning for the new site, positioning us to build on our progress in 2017, a year of getting organized for the Placemaking Movement. You can expect new voices on our blog, new case studies of great public spaces, and more conversation around the big issues facing public spaces around the world. We hope you enjoy our new website, stay updated by subscribing to our newsletter, and continue to join us in the movement for better public spaces!